Cyprus is the very origin of the name of copper, from aes сyprium (metal of Cyprus), later corrupted to сuprum (Latin), from which the words derived, coper (Old English) and copper, first used around 1530. Because copper is one of the few metals that can occur in nature in a directly usable metallic form there is clear evidence of very early human use in several regions, from c. 8000 BC. Thousands of years later, it was the first metal to be smelted from sulfide ores, c. 5000 BC, the first metal to be cast into a shape and the first metal to be purposefully alloyed with another metal, tin, to create bronze, c. 3500 BC. Many of the exposed massive sulphide deposits around the Troodos Mountains in Cyprus have been mined for copper since the Bronze Age and copper production continues at the privately owned Skouriotissa Mine (29,465 t of copper cathode produced by Hellenic Mining Company from 2007 to 2016 using a SX-EW plant; Cyprus Mines Services, 2018c). There is widespread evidence of ancient copper mining throughout the Troodos Mountains with more than 140 slag piles recorded. The largest slag pile was at Skouriotissa and was estimated to exceed 1 Mt. It was built between ca. 620 BC and 310 AD. Modern mining commenced in Cyprus in the 1920s with more than 74 Mt of massive ore extracted from about 30 deposits in the following 50 years. Production focussed on pyrite, copper, gold and silver, although some of the Cyprus deposits also contain appreciable amounts of zinc. The largest known deposit in Cyprus is Mavrovouni where 16.5 Mt at approximately 4.5% Cu was extracted between 1929 and 1974. Highlighted mines are within Caerus’s Prospecting Permits. 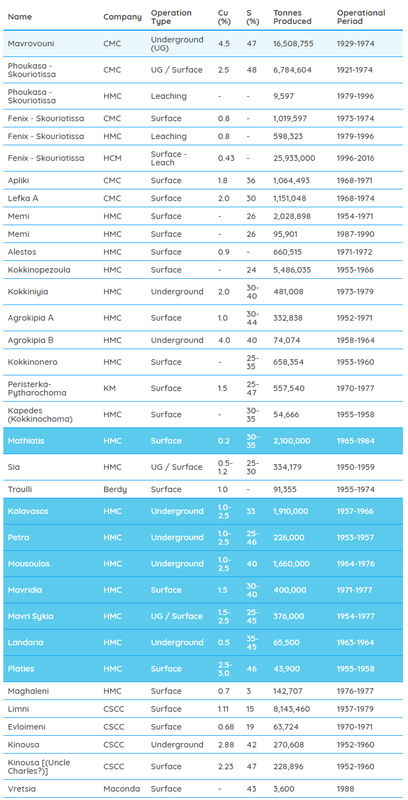 CMC: Cyprus Mines Corporation; HMC: Hellenic Mining Company; KM: Kambia Mines; Berdy: Berdy Mining Company; CSCC: Cyprus Sulphur and Copper Corporation; HCM: Hellenic Copper Mines; Maconda: Maconda Mining Company; CMD: Cyprus Development Co.
Copper mining in Cyprus was significantly disrupted and essentially curtailed in the 1970s after Cyprus was partitioned following the dispute between Greece and Turkey. This was further compounded by adverse changes to global supply and demand in the copper market. Partition led to the largest mine at Mavrovouni, the Karavostasi port and numerous prospective areas ending up in occupied territory or United Nations-controlled areas. It also increased sovereign risk and led to declining international investment in Cyprus. At this time, some very large copper mines in Africa and Chile started production, leading to supply increases, while the end of the Vietnam War in 1975 depressed global copper demand. In short, the decline of the Cyprus copper industry, and its subsequent failure to re-emerge, was not because the mines were exhausted or indeed that the Troodos Mountains are not prospective or poorly endowed. For an area that has been so productive and that offers such prospectivity the paucity of modern exploration and investment is startling. Whilst the presence of copper in Cyprus is well-documented it is widely considered that there is little gold in Cyprus. This is a fallacy perpetuated from historical inaccuracies. The gold content of many of the deposits was poorly documented or not tested, and so was rarely included in the historical mining statistics. There is extensive evidence that the massive pyrite deposits contain appreciable primary gold. Furthermore, the weathered zones above many deposits are highly enriched in gold and silver. For example, miners targeted “Devil’s Mud” – a narrow layer above the massive sulphide bodies – because it was so highly enriched in gold and silver (presumably supergene). The first preliminary assays of Devil’s Mud were taken from Skouriotissa in 1920, but it was never seriously investigated until depressed copper and pyrite prices in 1932 forced the Cyprus Mining Corporation (CMC) to investigate a possible precious metal income stream. Devil’s Mud was immediately identified at Skouriotissa with “areas of high-grade ore running as much as 50 ounces of gold per ton, though with very little silver, and, conversely, other areas containing 800 ounces of silver a ton and only traces of gold.” (Lavender, 1962). These discoveries led to exploration elsewhere in the Troodos Mountains and ultimately the mining of Devil’s Mud by CMC at seventeen locations, albeit most of this mining was very small scale. During 2016, the Hellenic Mining Company commissioned a gold circuit at Skouriotissa to process the oxide material in the area. CMC’s experience of the Devil’s Mud clearly shows that gold and silver are widespread throughout Cyprus. The primary pyrite ores, however, were never exploited because the technology to extract gold and silver at that time was not advanced enough to be economically viable. This is not the case today. BMG Resources reported numerous gold intercepts at the Mala Prospect, including 6 m @ 3.70 g/t Au (MALRC007) and 5 m @ 2.15 g/t Au (BMG, 2014a). Zinc was also not considered when mining the Cyprus deposits, even though it is widely encountered and could be a reasonable addition to their exploitation. BMG Resources reported numerous zinc intercepts with copper-gold-silver at the Mala Prospect, including 6m @ 4.10% Zn (BMG, 2014a). A final consideration with regards the economics of the Cyprus deposits is the value of pyrite itself. Carbine Resources (2014) have used a value of US$86/tonne for pyrite in their low-grade copper-gold Mount Morgan Scoping Study and First Quantum (2014) appear to generate a value of approximately US$40/tonne for pyrite from their Pyhasalmi copper-zinc operations in Finland. Source: Competent Persons Report for Caerus Mineral Resources produced by Rocklore Exploration Services Limited.